The Inox people have been living peacefully in the Land of the Waterfalls for a long time, but now there is a dangerous threat. Evil Rhujas roaming the land want to capture the gemstones of the Inox. That's why the Inox have selected the hardest to reach and most dangerous place to hide their gemstones: the rock wall behind the Iquazú waterfall. Their water dragon Silon blocks the waterfall so that the brave Inox can rappel down the rock wall behind it to place their gemstones there, out of harm's way. The gushing water and the dangerous water snakes at the bottom will stop the Rhujas from getting the gemstones. Which player in Iquazú will manage to use their cards skillfully and place their colored gemstones in the best spots? 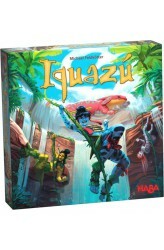 Each turn in Iquazú, players either draw fo.. This is a tile-laying race game with players starting with boards that are identical, and one player drawing tiles that they all will use. They race to get their explorers to temples first and earn points. Along the way they can collect additional points by collecting items off the paths they create. 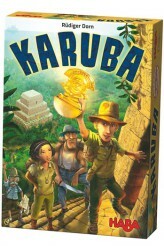 Description from the English Ruleset: Many moons have come and gone since your boats departed on the journey to Karuba. Once you arrive on the island, each player will lead an expedition team of four adventurers. Now you just have to navigate your way through the dense jungle to make it to the temples. „Just“ may be something of an understatement; the ancient jungle trails have to be found and uncovered first! Hurry up and be the first to reach the temples to c..
Super Rhino! presents players with an incredibly heroic – and regrettably heavy – rhinoceros who is eager to climb a tall building and leap other tall buildings in a single bound. First, though, you need to construct that building. Players each start the game with five roof cards, and they take turns adding walls and roofs to a single building. On a turn, you first place walls on the highest floor, then you choose a roof card in your hand and place it on the wall. Each roof card bears markings that indicate where the next player must place walls on the card. In addition, some roof cards force a player to perform special actions, such as placing a second roof, changing the direction of play, or moving Super Rhino to a new location on the tower. Keep your hands steady! 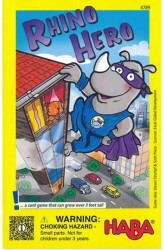 ..
Rhino Hero is back on the job — and this time not only does the wobbly skyscraper need to be climbed, but there will also be fierce battles between the four super-heroes Rhino Hero, Giraffe Boy, Big E. and Batguin. Who will win the battles and not let themselves be bothered by the mean, hanging spider monkeys? 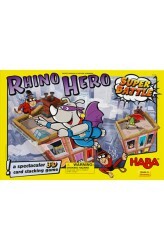 Rhino Hero: Super Battle is a turbulent 3D stacking game. https://youtu.be/OjP2x8MOc0I ..